My site is specifically for storing my photographs. I need these photo's to be seen so that those places that I may have an exhibit will be able to look at new works. That is why uptime is crucial for me. When I did suffer from issues-they were always solved in a professional manner. This host is very efficient and proactive in their approach to taking care of their clients. I am very pleased to be here and plan on staying. Am very satisfied with performance with this host, they are organized and seem to try to work ahead of any issues. Things happen but that is true anywhere, right? They jump on it as quickly as anyone so am good with that. Very pleased with ixwebhosting, they do a good job and offer lots of unlimited and discounted features, this is a good thing. I have no desire to move somewhere else as long as it's a good as it is now. My time here has been just fine, they obviously have a handle on their business. Their tech support makes me happy, never an issue to slide by, although there have not been too many tickets to submit to them so that is definitely a good thing. I'm happy to be here, they were a big help in making my move go well. I havn't had many issues since then so can't make additional comments about that but am happy with everything else. Good place to be if you are looking for a host. My experience here has been pretty positive, always an issue here or there but nothing major, and they get on the little things quickly. Have been with ixwebhosting for a year and am pleased with their service. My problems have been far and few here, but they have a good tech support guy named Steve who is very helpful and seems to know what he's doing. So am glad for that. Would recommend. After completing my clients website and hosting it on IX, I recently switched a second account from my old hosting company and I plan on switching a couple of others in the near future. Any new clients I get, I will recommend that they use IX." 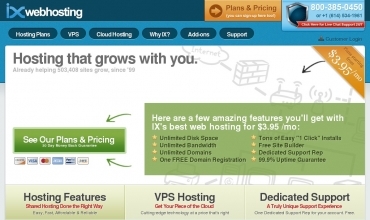 I've had IXWebhosting for over two years, so far has been great choice for budget web hosting. Great features, no hassles, friendly, helpful service, very reliable servers. Very occasional server problems (3 or 4 in two years) have been remedied promptly with their 24/7 live support. Trouble tickets (essentially e-mail support) are responded to within 24 hours, often much faster than that. I have had no real problems with reliability, and downtime is minimal, average for the industry it seems to me. The only shortage is that IXWebhosting uses a very old version of SpamAssassin. Most spammers now know how to get around the things older version of spam checking software look for, so ALL spam gets through. Apart from that everything was excellent. They spent as much time on my case as required to ensure that my site was up and running before they let me go. I should quote the recent encounter with your technical specialist, Alex, who took the time and patiently guided me through the issues I was facing. He eventually let me go after I assured him that my site was working as required.